Are We Really at Battery Parity Already? Let’s make an assumption. I do not believe it is valid based on the work of Mark Jacobson and team at Stanford and The Solutions Project, but for this discussion, let’s say it is. Climate reform culture says we can’t go beyond about 40 percent alternative energy penetration in the grid without dispatchable storage. And, that storage is a long, long way off. What this means is that wind and solar, because the wind does not blow all the time, and the sun does not shine all the time, can only be utilized for so much energy before their intermittent capacity is overwhelmed by energy demand. To allow our energy infrastructure to reliable provide energy at all times when it is needed and in a sufficient quantity with only non fossil fuel alternatives, we need to be able to generate and store excess energy so that it can be available–dispatched–when needed. Because wind blows at night in many places, and because solar has the capacity to generate more energy than needed even at peak times of energy use, if we could just capture this excess energy and store it for later, our energy troubles would be over, or at least much reduced. The challenge though, is that energy storage is in its infancy, or at least this is the predominant belief held by most energy experts. However, like solar photovoltaics and wind, batteries are massively ahead of schedule. This is particularly so for lithium-ion batteries used in hybrid and electric vehicles, and phones and almost all other rechargeable battery applications including grid storage. The reason is the construction of those giga battery factories. Ten gigabattery factories are in the works according to Greentech Media (GTM) as of June 29, 2017, with Elon Musk considering four new gigafactories. Batteries are following the path of wind and solar cells. Lazard’s levelized evaluation of energy storage in 2017 has fabulous news. The costs of components on Lithium-ion batteries are dramatically lower 2016 to 2017— from $0.15 kWh to $0.11 kWh! In 2015, the average was $0.30 kWh. GTM Research in Australia says batteries are at parity with gas peaker generation in 2025 from August 2017 research before the 2017 battery price fall was published. In Germany, battery parity is reached at $0.18 to $0.24 per kWh according to Australian investment firm Morgans in 2014. In 2016, battery parity for residential reaches parity in 2018 in Germany, according to GTAI, Germany Trade and Investment. 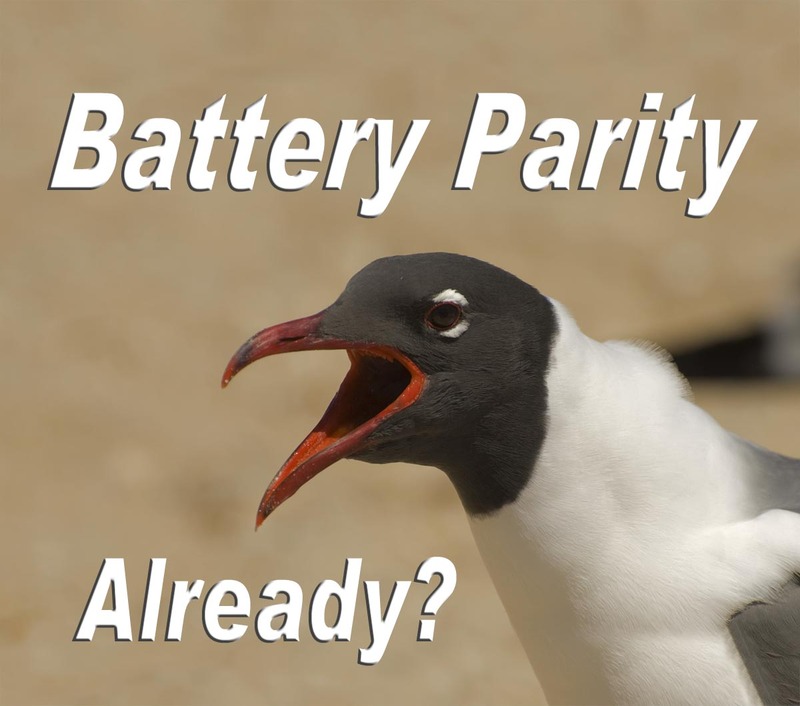 Bermudez, in the Journal of Renewable and Sustainable Energy from work in 2016, says battery parity is at $0.10 kWh. They also cite $0.30 kWh as the cost in 2016 and $1.00 kWh as the cost in 2015.